Tire cupping, or scalloping, is usually considered a sign of some problem. The most blamed item is out of balance. Tire irregularities, loose steering head bearings, dings in the rim, and fork or frame alignment are also blamed. None of that is true by itself. This page applies to the front tire on solo bikes. Sidecar tires exhibit wear patterns, but nothing about a sidecar is symmetrical to start with and tread is harder for me to read. This page is not about why the left side wears more in a country where we drive on the right hand side. You may real all about that aspect on this website. Tire cupping is a sign of normal tire wear. Chris (Native) just up and did these fine drawings and emailed them to me. This is not the first time that he has fixed my poor art work. My thanks to Chris. 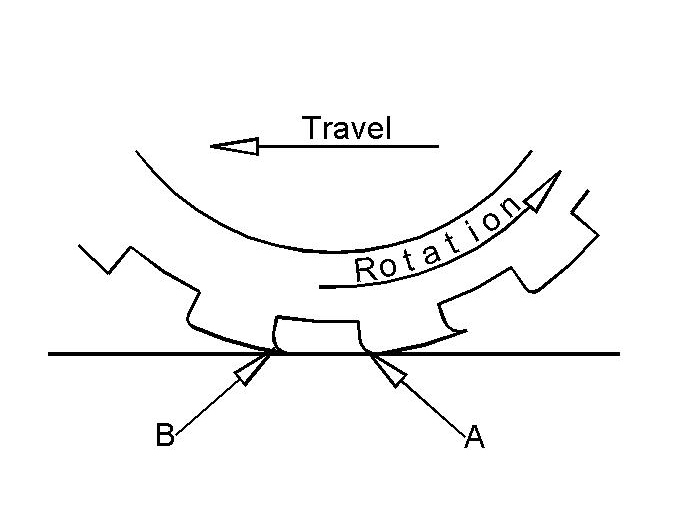 This is supposed to be a side view of a typical front motorcycle tire under braking stresses. See how the breaks in the tread get bent back from the traction? The trailing edge at B collapses into the empty area that is between treads. That edge wears little because it isn't touching the road. Later on it shows up as a high spot. This view is supposed to be a straight on view of a front motorcycle tire under stress from hard cornering. The spot A, the outside of the tread block, collapses into the empty space and doesn't wear down. The part at B takes most of the wear and shows up as "rounded off" later on. This wear is normal for braking and leaning. If you do little of either then the wear will be far less. The softer the tire compound the greater is the distortion from wear of this nature. Racing tires that are really soft and sticky get worn out in a few hundred miles. Super hard road touring tires, gently ridden, can last 15 k miles. A heavier bike ridden exactly the same as a light one will "cup" more. More tire pressure will allow a bit less cupping. If two identical bikes were ridden by two different riders, they probably would have a different tire wear pattern. The one with more cupping would indicate that the rider actually rides the bike. That means that he/she rides harder. A poor example of front tire wear. Sorry, but I haven't seen a better example when I had my camera in hand. With this knowledge one can "read" a tire. More accurately, one can learn how the rider brakes and corners. Leaning over will leave a high spot on the outside (away from the center line of the tire) of the tread. Braking will leave a high spot at the rear of the tread, viewed as it touches the ground. If one corners and brakes at the same time, the outside rear will have the high spot. From examining the wear pattern one can learn that the rider likes to lean one way more than the other. The rider will also brake harder while leaning one way more than the other. Compare the right side and left side wear. The more worn, the more that the rider is comfortable in that lean. Look at the rear of the tread block and see which side is more worn. That is the side that the rider is more comfortable using the brakes. Almost no rider is symmetrical in riding habits. It is common to find braking wear on one side and cornering wear on the other side. The rider brakes before going into a right hand turn and then goes through. On left hand turns the rider is willing to apply brakes while in the turn. Many combinations are possible. 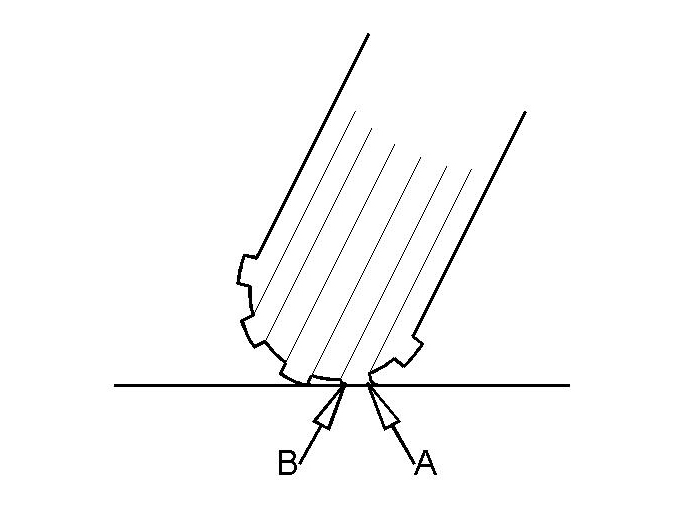 This cupping wear pattern description applies to every tread block on the tire. Sometimes one will find significant cupping and every third or forth block is worn far more than the others. This is evidence of a wheel that is out of balance. Irregularly worn blocks are typical of an out of balance wheel. Really loose wheel bearings could also add to this odd wear. Next time that you are around some motorcycles, try "reading" the tire wear. Tell the rider which side is what and watch the surprised look at your pronouncement. The rear tire has quite different stresses on it and they are always more subtle and therefore harder to read. The rear has both braking and acceleration stresses. The wear from leaning is far less. Since the front tire is on the same bike as the rear tire, I use the front for my "readings" of rider habits. 1. A tire with a harder rubber compound will allow the tread to stay more rigid. That will not permit as much cupping wear. 4. Don't corner as hard. 5. Don't brake as hard. All of this is mostly useless, but fun at parties and such.